Which players will be under the most pressure this postseason? SI.com examines five players that will be under the microscope. Welcome to the third annual All-Bullseye Team, which highlights five players who will be facing immense scrutiny during the upcoming playoffs. Be sure to check out the 2014 and 2015 versions of this list. It’s certainly tempting to view the next three months as an extended, jubilant coronation. The Warriors’ absurd 54-5 record and Stephen Curry’s mind-boggling ascension seem worthy of that level of respect. But that’s an early March thought, not a late April one. Come playoff season, the teams that are currently staring up at the Warriors (and the Spurs and Cavaliers) will be shifting gears, first hoping to spring an upset and then weighing their off–season options should they fall short. With that in mind, here’s a look at five players whose situations set them up for life under the microscope during the 2016 playoffs. Boston entered the 2015 playoffs playing with house money, thanks to a strong late-season push following the Rajon Rondo and Jeff Green trades, and then promptly went broke against Cleveland in the first round. There’s a totally different dynamic at play this season: The Celtics are on track to enter the playoffs with home-court advantage (although the East is tight enough that a late–season swoon could have disastrous consequences) with a roster that didn’t see any major midseason movement. Since January 1, Brad Stevens’s team has played like it's a No. 3 seed, posting the conference’s third-best record (18-11) and third-best point differential (+4.3). This is a squad whose performance deserves expectations: These guys should win a series, despite the many young faces that pepper the rotation. A similar story applies to Isaiah Thomas, Boston’s leading scorer (21.4 PPG) and assist man (6.8 APG). Last season, the 5'9" Thomas was simply the bearer of good vibes, arriving at the trade deadline and helping push the Celtics into the No. 7 seed. He found the playoffs to be much tougher sledding, as the Cavaliers’ long and quick backcourt defenders harassed him into 33.3% shooting during Cleveland’s four-game sweep. There was really no skin off his back: This was Thomas’s first exposure to postseason basketball after spending his first three seasons with the perpetually lottery-bound Kings. But Thomas, who was selected to his first All-Star team this season, should welcome increased individual expectations this time around. Unlike last year’s 40-42 squad, Thomas will lead Boston into the playoffs with a clear identity: The Celtics play at the league’s third-fastest pace, they have forced a league-leading number of turnovers, and they have tabbed him as the clear No. 1 scorer. Although Thomas’s shooting numbers aren’t sparkling (42% overall and 34% from deep), it’s worth noting that he’s often operating under duress given Boston’s shortage of playmakers and that he’s compensated from an efficiency standpoint by getting to line a career-high 6.2 times per game. He’s also posted strong numbers in clutch situations. This year, Thomas is shooting 47.2% overall and 37.5% from deep in games that are within five points in the final five minutes of regulation and overtime, putting the 2011 second-round pick among the league’s leading clutch scorers. Nevertheless, Boston has dealt with its share of inconsistency in close games this season, posting a 17-17 record in games that go to “clutch” situations. If the Celtics are going to play to their potential in the postseason, Thomas will factor heavily in their late-game success. And, because he’s undersized and his presence therefore poses problems defensively, it’s even more imperative that he find ways to get it going. At his best, Thomas is an entertaining and devastating weapon who is blessed with a great handle to create looks for himself and a natural scorer’s instinct and touch. Here, Thomas gets a switch onto a longer, slower defender, expertly milking the advantage in space before racing to the basket for an and-one. On this one, Thomas sizes up a strong defender, Draymond Green, before catching him off guard with a burst to the basket for a clean lay-up late in a close game. Beating Green on a key play in a tight game is no small achievement. This third clip shows Thomas using a beautiful stutter-step move to freeze Utah’s defense and set up another point-blank basket that proved key in a tight, tense contest that Boston wound up winning. It’s too early yet to play the matchup game, as Boston’s playoff positioning has yet to fully shake out. Regardless of who the Celtics draw, and which defenders Thomas will face, the playoffs should serve as Thomas’s longest and most important “alpha dog” audition yet. Before the All-Star break, SI.com examined Toronto’s strong, steady season, noting that the playoffs have make-or-break potential for Raptors coach Dwane Casey, who is in the final guaranteed year of his contract, and have big implications for Kyle Lowry, whose case to be included among the NBA’s top five point guards could really use some postseason success. Toronto has gone 4-2 since the All-Star break, highlighted by a home victory over Cleveland that saw Lowry deliver a career-high 43 points and the game-winner. 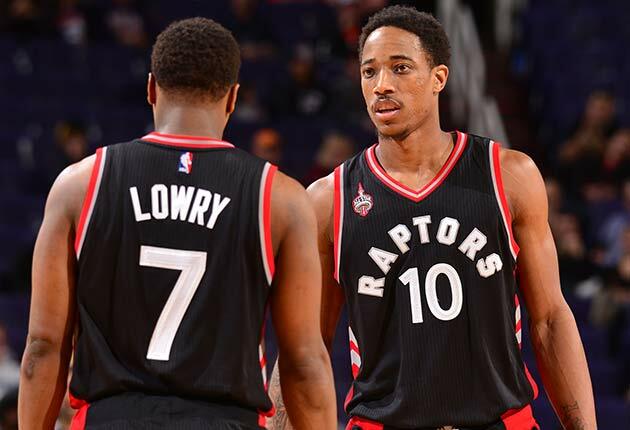 With 11 home games in March, the Raptors should have every opportunity to set a new franchise record for wins (surpassing last season’s 49) and finish with a top two seed. Life is good in The Six. For DeMar DeRozan, the 2016 playoffs will be more about bolstering his reputation than maximizing his earning potential. The 26-year-old wing has made the most of his contract year, scoring a career-high 23.1 PPG, getting to the line a career-high 8.2 times, dishing a career-high 4.1 assists, shooting a career-best (and almost passable) 34.3% from deep, and posting a career-best 21.1 PER. He's set to hit the market this summer as the top unrestricted shooting guard, and he has every reason to believe he should command a max contract, whether in Toronto or from outside suitors. The shortage of in-their-prime scoring wings on this summer’s market should guarantee DeRozan a hefty pay day and his next deal could push into nine-figure territory thanks to the rising salary cap. Ca-ching. • MORE NBA: SI.com roundtable: Who is in your alltime starting five? Still, that reputation needs bolstering and the time is now given Toronto’s record relative to the rest of the East (the Raptors are 4.5 games up on the No. 3 Celtics). DeRozan has done well to work around his lack of range this season, attacking deep into the paint, making strides as a drive-and-dish guy and cutting down on his long twos this season (just 24.3% of his shots are long twos this year, the first time in his career he’s been under 31%). Nevertheless, there are fundamental questions: he creates the vast majority of his shots for himself (which can lead to pounding, ball-stopping and settling), Toronto has defended far better with him off the court (95.9 defensive rating) than on (104.5 defensive rating) this season and he proved to be surprisingly easy to shut down during the 2015 playoffs. In a four-game sweep at the hands of the Wizards, DeRozan shot just 40% from the field, got to the line just 4.3 times per game, and struggled to generate high percentage looks against a defense playing at playoff intensity. What’s more, he didn’t hit a single shot during clutch situations during the series (within five points, in the last five minutes of regulation or overtime). Here’s a look at a few of his clutch misses from last year’s playoffs. Note that he’s creating for himself, as he generally prefers to do, and that the one-on-one play kills the team flow and leads to contested looks that defenses love. Unfortunately, Toronto’s big win over Cleveland produced a minor dose of DeRozan-related déjà vu. Playing through an illness, DeRozan shot just 1-for-11 from the field. DeRozan deserves a pass given the health-related circumstances, but the rough showing during a high-intensity, playoff-type game was a reminder of last year’s disappointment. Plus, tough matchups with the likes of Indiana’s Paul George or Chicago’s Jimmy Butler could be waiting in the first round. It’s not that hard to envision either George or Butler taking DeRozan out of his game with their ball-hawking perimeter defense. That would seriously impact Toronto’s ability to deliver on its advance-or-else expectations, wouldn’t it? There are max contracts that teams can’t wait to hand out, and there are max contracts that teams offer through gritted teeth. A big showing in the postseason, perhaps with some memorable late-game heroics, could help land DeRozan in the former category, rather than the latter. But another first-round flop might leave him trending towards a Joe Johnson-like existence. Rick Reilly’s cover story for this week’s Sports Illustrated illuminates the care-free feeling to Golden State’s title defense and run at 73 wins. One recurring theme from the story: Historically great runs never last forever. It would be a major mistake to look past the Warriors’ current success simply to agonize over the future. Why wait for decades to witness this level of greatness only to dwell in its eventual demise? ​However, there are practical concerns for the Warriors as they approach the playoffs, whether or not they eclipse the 1996 Bulls. 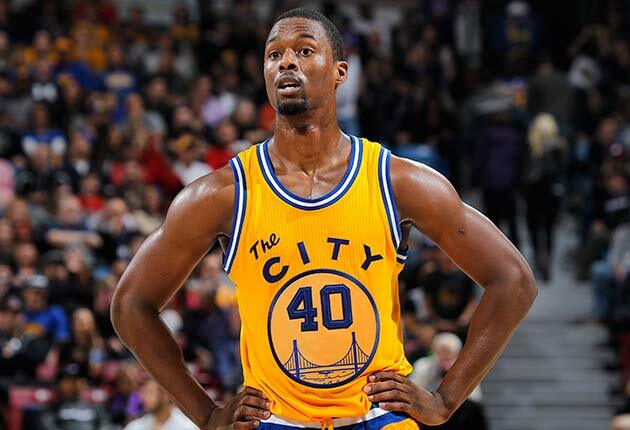 Harrison Barnes and Festus Ezeli are set to become restricted free agents. The salary cap is set to spike this summer, helping Golden State keep its super team together or helping it build an even more talented version. Kevin Durant rumors are already flying. There are other issues down the road: Andrew Bogut and Andre Iguodala will be in contract years next season, and Stephen Curry will be up for a new max deal in July 2017. While many of these moving parts can wait, Barnes isn’t one of them. Golden State’s starting small forward reportedly passed on a four-year, $64 million contract offer last fall in hopes of attracting max-level offers this summer. Although an ankle injury kept him out of the lineup early on, Barnes is averaging a career-high 12 points and 4.5 rebounds while shooting 41.2% from deep and playing a key defensive role in the Warriors’ small–ball lineup. There’s no question that the 2012 lottery pick continues to sacrifice for the good of the team. Indeed, Golden State might be the only team in the league that would ask Barnes, a gifted athlete with a smooth shooting stroke and a good comfort level working in post-up situations, to take less than 10 shots per game. Something has to give when Stephen Curry, Klay Thompson and Draymond Green are all on the court together, and that something has been Barnes’s license to truly blossom as an all-around option. His usage rate is a modest 16.6%, and his most important offensive task is cashing in wide open threes as a fourth option. Look at how much room he has to line up these two short-corner three-pointers against the Hawks. Easy like Sunday morning. There are arguments to be made on all sides about Barnes’s importance to the Warriors. A cynic might reasonably argue that the Curry/Green/Thompson trio has reached such heights that plugging in a Barnes replacement, at a fraction of the max-level deal he might command, would be best for the roster’s long-term flexibility. Evidence for this position can be found in the Warriors’ starting lineup numbers when Barnes was out. A Barnes backer, though, would respond with Golden State’s blistering performance when Barnes shifts up to power forward and Green moves to center. The Warriors have used this look fairly sparingly this season, perhaps to save it for the playoffs, but it has been the league’s top-performing group by a mile. Those numbers are flabbergasting, and they’ve been posted against potential postseason opponents like the Thunder and Clippers. Remember, the other four players in that group are already under contract for 2016-17 and—newsflash!—it’s unlikely that any team will solve the group’s immense two-way versatility over the summer. The Barnes skeptic might argue that a player costing 20% of what Barnes will cost next year could replace 75% of his offensive production, and that Barnes, 23, would be better off spending the next four years somewhere he could grow into a central role as a No. 1 or No. 2 option. The Barnes backer might argue that keeping together the league’s best lineup, one that’s producing a +49.1 net rating (! ), is worth any price, including foregoing a run at Durant, to a Golden State team whose best players are just beginning to enter their primes. The playoffs, then, will become the stage for Barnes to make his final arguments for max money, to make a case to Warriors ownership that continuity is preferable to a Durant dream scenario, and to determine whether chasing rings is worth continuing to operate in a confined role. There’s no shortage of juicy postseason storylines when it comes to high-profile power forwards. Cleveland’s Kevin Love needs to make up for lost time due to last year’s injury and make a strong case that he shouldn’t wind up on the block this summer. San Antonio’s LaMarcus Aldridge gets his first crack at playing for a true contender. And Golden State’s Draymond Green enters the 2015 playoffs as the hunted rather than the hunter. But Blake Griffin has them all topped when it comes to pure scrutiny: L.A.’s five-time All-Star set himself up as his team’s potential fall guy the moment he made the unfortunate decision to punch a team employee, breaking his hand in the process. Since news of the incident broke, Griffin has apologized, accepted a four-game suspension, made nice with the employee that he punched, and worked to get himself “very close” to making his return to the court. Since losing Griffin following a Christmas Day win over the Lakers, the Clippers have dumped Josh Smith and Lance Stephenson, added Jeff Green, tried to revive Paul Pierce, and managed to post a 22–7 record and +8 point differential (both ranking third-best in the league behind San Antonio and Golden State). Chris Paul has been phenomenal, averaging 21.8 PPG, 10.2 APG and 4.6 RPG while seeping up extra touches and finding ways to take advantage of the extra spacing that exists when Griffin and DeAndre Jordan aren’t playing alongside each other. There is zero doubt that Griffin gives the Clippers their best shot to beat the Warriors, who are up 3-0 in the season series to date. Griffin averaged 25 PPG, 8 RPG and 5.5 APG in his two appearances against Golden State this season, and L.A. took early leads before blowing both games late. Without Griffin, the Warriors led for the final 46 minutes of their recent victory at the Staples Center, looking totally comfortable in a casual shootout environment. Let’s not overlook how central Griffin was to the Clippers’ 2015 postseason run: he averaged 25.5 PPG, 12.7 RPG, 6.1 APG and played a whopping 39.8 MPG against the Spurs and Rockets, regularly pushing himself to the point of exhaustion. When Griffin sat during last year’s playoffs, the Clippers posted a truly awful 114.8 defensive rating and a -11.8 net rating. When quality teams had the opportunity to fully prepare for L.A.’s supporting pieces in a series, they absolutely ripped them to shreds. 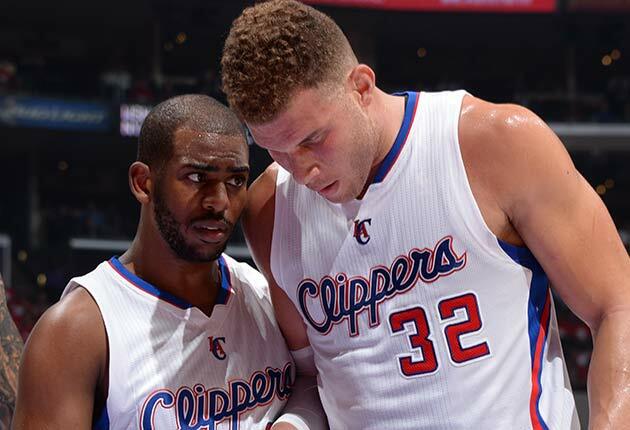 The Clippers’ new pieces might be better than last year’s motley crew, but not vastly so. Griffin’s athleticism, physicality, foul-drawing presence and play-making ability are all essential to playing the match-up game with Golden State. Yes, there are very good reasons to prefer Draymond Green to Griffin: he’s a better low-post defender, he’s a more reliable three-point shooter, the ball sticks in his hands less, and he’s a more natural fit as a small ball five. Even acknowledging all of those points in Green’s favor, Griffin more than holds his own. There’s really no overstating his impact on the Clippers’ approach: he can play the pick-and-roll and pick-and-pop games with Paul, he can push the ball up in transition himself, he can play the two-man game with J.J. Redick on the perimeter as a screen-setter and distributor, he can target DeAndre Jordan for lobs from the elbow and, when all else fails, he can bull rush at the rim in search of whistles. Needless to say, his replacements can’t do most of those things, and they certainly can’t do all of those things in a single workhorse package. Take this play, which Griffin makes look routine. He catches and pitches, set a screen, slips to the hoop, takes a few gather dribbles, attacks the chest of a taller and longer defender (Festus Ezeli) and finishes a contested look before help can arrive. He does all of that in less than five seconds. While no one really wants to get Golden State into a run-and-gun shootout, it’s important to find opportunities to score against them before their defense is set. Of course, the easiest way is to convert in transition after Warriors turnovers. Griffin has grab-and-go ability whether he’s playing the passing lanes, chasing down a loose ball or simply corralling a defensive rebound. Here his attack mentality after a stop leads to a bucket on the other end. This is exactly why Paul has repeatedly insisted in recent months that the Clippers’ championship hopes rely on Griffin’s return to form. Without Griffin, L.A. has no answer for Draymond Green on either end, leaving too much burden on Paul, who faces a daunting matchup himself with Stephen Curry. To boil this down, the Clippers might not have enough to push the Warriors with a fully healthy Griffin, but they would almost certainly be easy pickings without him. With years of pent-up frustration over postseason shortcomings bubbling, Griffin must bring his best game to the playoffs or risk the type of backlash he’s yet to experience during his decorated career. It’s hard to imagine a more prototypical postseason scapegoat than Enes Kanter, who hits for the scorn-generating grand slam: he’s overpaid, he’s clearly exploitable on defense, he’s wholly lacking in big-moment experience, and he plays for a team facing major pressure to win now. Let’s quickly run through some pertinent facts. Kanter’s $16.4 million salary ranks in the top 20 league-wise; the other 19 players all have All-Star appearances to their names, while Kanter is playing just 20.6 MPG off the bench for Oklahoma City. Entering Wednesday’s action, Kanter was fully justifying his long-standing reputation as a slow-footed sieve, ranking dead last among centers league-wide with a -2.4 Defensive Real Plus Minus (DRPM). Meanwhile, the 23-year-old 2011 lottery pick has logged just 43 postseason minutes during his five-year career, all of which came when his Jazz were swept out of the 2012 playoffs by the Spurs. Oklahoma City’s circumstances do him no favors: the Thunder not only face impatience that’s built up over the four seasons since they last made the Finals, but they also face the terrifying prospect of Kevin Durant’s impending free agency in July. ​​To his credit, Kanter has averaged 12 PPG and 7.5 RPG despite his reduced role, shooting 56.5% from the field and posting a 23 Player Efficiency Rating by pounding the offensive glass, scoring on the block and serving as a quality pick-and-roll target. The looming question come April and beyond, however, is whether those attributes, balanced against his defensive deficiencies, can succeed in making him anything more than a bit player in the postseason. Although he’s had his moments in Oklahoma City’s two matchups with Golden State, Kanter was reduced to a meme down the stretch Saturday, as he glumly shrugged on the bench when Stephen Curry rose up to hit the game-winning three-pointer in overtime. In fact, despite being Oklahoma City’s third-highest paid player behind Kevin Durant and Russell Westbrook, Kanter watched from the sidelines during the game’s final 12:47, with Billy Donovan preferring to counter Golden State’s small-ball lineup with a frontline combination of Steven Adams and Serge Ibaka down the stretch of regulation and then a smaller look featuring Ibaka and Durant for much of overtime. For Donovan, this doesn’t seem like a very difficult decision. 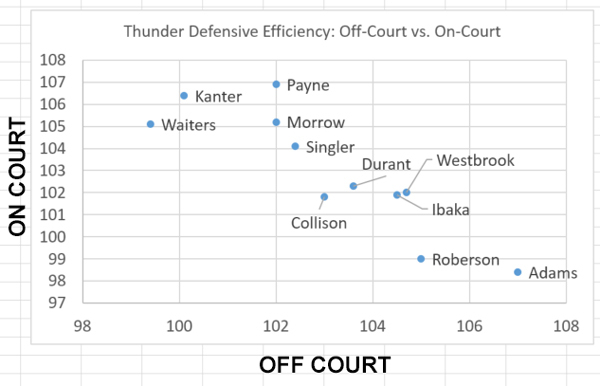 The following chart shows the Thunder’s defensive rating when each of its main pieces are both on and off the court. 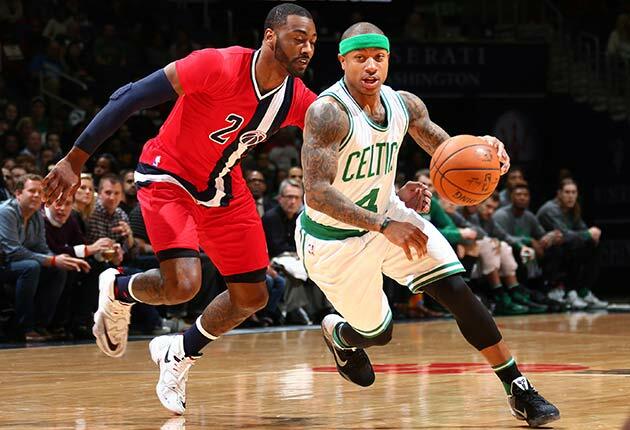 Players with a positive defensive impact when they’re on the court (like Adams) appear towards the bottom right. Players with a negative defensive impact when they’re on the court (like Kanter and Waiters) appear to the upper left. Kanter’s differential—106.4 when he’s on the court and 100.1 when he’s on the court—is the largest negative differential on the roster. At this point, Oklahoma City looks very much like a five-man team: The Thunder’s preferred starting lineup of Westbrook, Andre Roberson, Durant, Ibaka and Adams boasts a sterling +19.7 net rating (better than the Warriors’ starting group) and an excellent 92.8 defensive rating (better than the Spurs’ No. 1 defense). Given that Oklahoma City currently ranks No. 14 in defensive efficiency, it should be clear that their bench-heavy units fall off a massive cliff. Entering the postseason, the Thunder should be concerned that the Warriors and Spurs will pick on Kanter, as they have picked on Kevin Love and other bigs this season, forcing him to defend awkwardly in space and to handle quick guards like Curry, Leandro Barbosa, Tony Parker and Patty Mills as they attack the paint. There’s no shortage of clips showing Kanter struggling to handle these responsibilities. Here’s Leandro Barbosa easily turning the corner for a smooth layup after drawing a switch on the pick and roll. Here’s Washington’s John Wall beating Kanter to the cup twice, first by sliding by him and then by attacking a wide-open paint when Kanter failed to switch. Here’s Dallas’s J.J. Barea patiently attacking Kanter off the dribble, waiting for him to sag off and then lofting an uncontested runner off the glass. Kanter defenders might assert that he’s made progress defensively this season (he posted a calamitous -3.9 DRPM in 2014-15). Even so, he remains an obvious weak link, one that can be exploited by the West’s top teams on any given possession simply by forcing to be active in pick-and-roll situations. Durant and Westbrook will play heavy, heavy minutes in the postseason. That’s a given. But if Kanter isn’t able to defend well enough to stay on the court, it will put significant pressure on Adams and Ibaka to log more playing time while also avoiding foul trouble. There aren’t any great answers here: While Dion Waiters, Kyle Singler, Anthony Morrow and even rookie Cameron Payne offer small ball alternatives, all four share Kanter’s lack of postseason experience and all four have their own warts at this point. 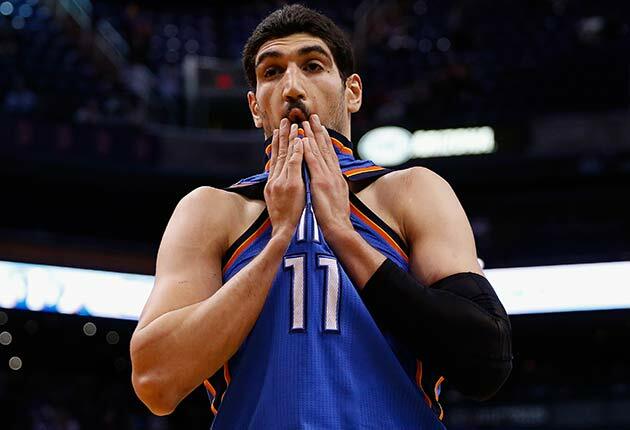 As scary it might sound, given everything laid out above, the Thunder really need Kanter.